Entering its sophomore generation, Chevy is proud to announce the Volt is done with its growing pains. After five years of listening to the comments and opinions of drivers and critics alike, Chevy has responded with a fully redesigned and updated electric hybrid, the 2016 Volt. Pulling their 2015 model early to ready themselves for the release of the 2016, Chevy is quite confident the 2016 Volt is the best electric hybrid in its class. As consumers, we’re glad to say that the Volt is not just what we expected, but more. Everything. The Volt went through complete makeover and pretty much changed it all. Exterior, interior, hybrid drive system, transmission, battery capacity, weight. You spoke. Chevy listened. While the Volt hasn’t yet made its debut at your Chevy dealers in Albany, NY, they are already anticipating the crowd that will be arriving with the Volt, ready to drive it away. The Chevy Volt was released for test drives starting this July and the results are in. After test drives and leisurely tours around cities and highways, drivers and critics alike both praise the Volt for its marked improvements. The Volt is more than an improvement not only from the years past, but in comparison to other hybrids currently on the market. While it’s immediately more sporty in appearance than others in its class, reviews say its more fun to drive. After dropping 200 extra pounds, it has become a lot more fun to drive. The lost weight adds to a more aggressive throttle that delivers more power leading to a quicker performance. Adding to 2016 Volt is a slightly larger 1.5L EcoTec engine. Being that the previous engine was a 1.4L and had some issues with noise, vibration and harshness when operating under gas power, Chevy went with a slightly larger engine which gives the ability to produce the power it needs to run while at lower engine speeds. This reduces the noise and vibration. Running on a new generation of EcoTec engines that were designed to waste less energy and reduce noise, it can also run on fuel which was a specific request by Volt drivers that Chevy addressed. The reviews also said the 2016 Volt is more connected to the road which is going to make it feel like a sportier drive. With better handling than both the Ford Fusion and the Prius combined and putting out a better 0-60 time than the Toyota Prius (Chevy is putting the Volt at 8.4 seconds to 60mph), the Volt is for sure a real contender for this coming year. The Chevy Volt will be delivering a wider range of miles on both electric and gas power. Chevy promised improvements with mileage and they over delivered. This means that the Volt will be able to travel for 53 miles on electric battery alone before it needs to go to its fuel tank for reserves. 53 miles! 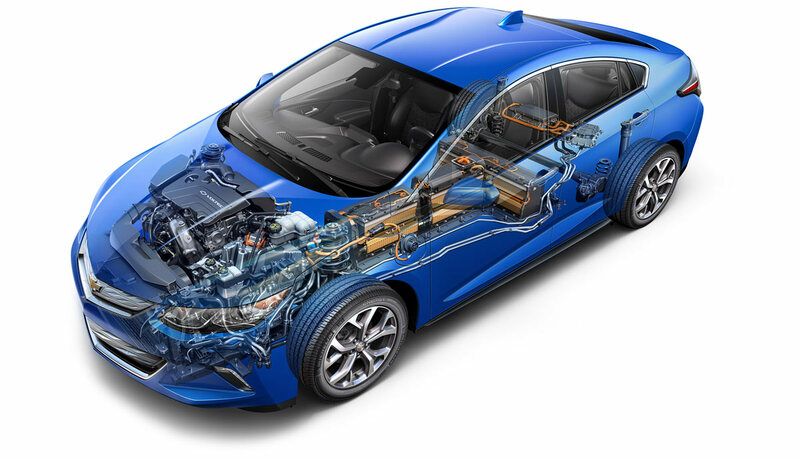 Every time you get in your 2016 Volt, it will be powered by an electric battery. How many trips to and from your work is that? How less will you be stopping at the gas station? How much money will you save? Volt drivers will be pleased to know that the battery has increased energy output while dropping 31 curb killing pounds. Even though the number of Compact Power lithium-ion powered cells has dropped from 288 to 192, revised chemistry has helped the energy capacity grow. This battery pack is what allows the 53 mile range of electric power. A fully charged battery along with a full tank will get you a total range of 420 miles. Once the electric power is used up, the gas engine works together with the electric drive system to team up and produces still a more efficient fuel economy. The range on the gasoline fueled engine is an EPA combined rating of 42 miles. On average, the Chevy Volt user won’t see a gas station except for around every 1,000 miles or so. Currently, GM predicts about 80% of the Volt is run on battery. If you consider that the average Volt driver will be doing most of their driving within a certain close range of city or town limits, than this makes sense. Think for a minute all of the driving you do in an average day. To and from work, groceries, kid’s schools, events, sports. Most of this occurs within a certain mile range. It’s this person that Chevy had in mind when designing the Volt. The practicality of producing a vehicle that runs considerably more on electric power than fuel saves time and money at the pumps, but also speaks to a much larger and growing demographic that Chevy is cornering right now. While every manufacturer is producing some kind of hybrid, only Chevy is offering one which has gone through a complete redesign and has produced better results than it even intended. That’s what overachievers do. They out-do and surprise even themselves. Really, isn’t that what you want in a car brand? When Chevy originally set out to update the Volt, they said “50 miles or more” running on electric alone. The 2016 Volt gets 53 miles. When Chevy said set out to improve fuel economy, they said “at least 40 miles”. Just like you guessed, the 2016 Volt now gets 42 miles per gallon. This gives the Volt an efficiency rating of 106 MPGe (MPGe = miles per gallon of equivalent. This measures the distance a car can travel electrically on the same amount of energy as contained in one gallon of gasoline.). While the third row, ‘seven passenger’ is all the buzz in the dominating SUV/crossover segment, the Chevy Volt is highlighting their three passenger back seat. That’s right, the middle seat is back. Coming equipped with a shoulder strap but sans lap belt and headrest, it does offer an extra seat for the smallest of the bunch. Because the battery is located underneath the middle seat, there is a slight bump up which would actually serve to make the smallest person who is doomed for that spot feel a bit better about their lot in life. The interior has been designed to accommodate longer time spent inside the vehicle, so it feels more livable. A cleaned up center stack is a vast improvements as are the simple knobs and buttons to designate climate control, heated front, passenger and rear seats. An 8” screen displays the infotainment and Apple’s CarPlay, a first for GM, which when connected to an iPhone allows for hands free and eyes free texting messaging through the use of Siri. Chevy has pulled out all the stops while producing the 2016 Volt. They have addressed every issue and concern any driver or critic has had. The release of the second generation Volt is sure to be a success. The 2016 Chevy Volt will start at $33,170 which is lower than its current MSRP of $34,170. Of course, once you take out the state and federal tax credits for the support of lower emissions, the price can be lowered as much as $9,000 making it a very affordable $24,170.